Does the proliferation of artificial intelligence (AI) threaten the accounting profession? Could accountants be replaced by automation, just like the switchboard operator, the film projectionist and the elevator operator? And how can you protect your career and prosper in the age of the accounting robots? The threat of technology is not new. Technology both ended and created jobs at least since the 1800s, when the advent of farming machinery wiped out many agricultural occupations. In our own profession, the introduction of computers, calculators and the electronic spreadsheet were all seen as threats to the livelihood of the profession. What’s different today is the sophistication of AI and its potential to replace much of what has traditionally been done by accountants. Repetitive tasks associated with gathering and processing data are already being managed through automated machine-learned systems. Invoices can be categorized, expense statements audited, invoice payments cleared, and bank accounts reconciled with very little, if any, human intervention. Almost all accounts payable and accounts receivable roles are incorporating automation to some degree. In addition, AI applications that can calculate analytics and assess risk already are in use in many organizations. 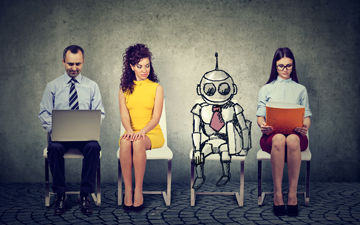 But, despite the initial, negative implications, the reality is that AI actually offers a huge opportunity to the accounting profession. When you think about it, continued intelligent automation can achieve the accountant’s holy grail — streamlined operations and increased efficiency, ultimately saving time and money. And, with recurring tasks out of the way, accountants will be free to tackle more complex issues, such as the interpretation of data and the implementation of business processes. But all this can only happen if accountants can see the potential and embrace the technology. Here are three strategies for embracing AI, rather than fearing it, and protecting your career. First, realize and acknowledge the possibilities inherent in AI. Software can crunch numbers and automate repetitive simplistic tasks more efficiently than any human possibly could. And, as the technology continues to develop, these robots will only get better. The implicit benefit is that human accountants can then be freed up to focus on more complicated issues. Consider this truism: It is no longer an accountant’s job to collect data but rather to interpret it, to make better and more informed decisions. The unfortunate reality is that, as routine processes increasingly get automated, clients will more and more view basic accounting services as commodities. After all, if every CPA offers tax preparation services, then buyers tend to make their purchasing decisions based on price. Which leads directly into strategy number two for future-proofing your career. Since humans can’t compete with AI when it comes to gathering and processing data, the differentiation has to happen elsewhere. Accountants will definitely win when it comes to complex decision-making. High-end, highly skilled accounting positions require creativity and critical thinking. Even with automation through AI, humans will still be needed to oversee strategy, balance conflicting business priorities, and ensure that ethical guidelines are followed. Plus, there is no machine that can build trusting relationships with clients; that can only be done by living, breathing human beings. More than ever before, we need to position ourselves less as human calculators and more as innovative experts who are trusted advisors. Deliberately downplay the business of crunching data. Emphasize instead your value as an irreplaceable expert source to help your clients maximize revenue and reduce expenses and taxes. Human interaction is what will separate you from AI. Market yourself to those who come to you for advice as an innovator who doesn’t just provide process support but also comprehends automation and data analytics. Build close relationships with your clients so that they want to partner with you, to help understand and master the future. AI won’t eradicate accountants; rather, it will revolutionize how we work. If you want to prosper as you step boldly into the unknown future, the only viable option is to be the accountant who is both educated on emerging technologies and focused on building human relationships. Merge Gupta-Sunderji CPA, CGA, is a leadership and workplace communication expert who turns managers into leaders, drawing upon her 17 years of first-hand experience as a leader in corporate Canada. Contact her or join the conversations on her blog at TurningManagersIntoLeaders.com and follow her on Twitter @mergespeaks.